In Steiner Schools, lessons are taught in integrated blocks and are allowed to follow sequential development over 3/4 weeks. Such a lesson format provides an opportunity for both the Teacher and the Class to cover a topic in depth and with uninterrupted concentration, whether it is a lesson on local geography or in silk painting. The day is divided into three parts – addressing in turn the head, heart and hands. The first part of the day is a two-hour session called the Main Lesson in which the most vital developmental subjects are taught. The morning is chosen for the Main Lesson when Teachers and children are at their most alert. It is the best time of the day to think and focus. The block nature of the lesson and the two hours given, allows for the integration of an across-the-curriculum approach in which a Mathematics Main Lesson for example can be enhanced by drawing, music, poetry and stories. 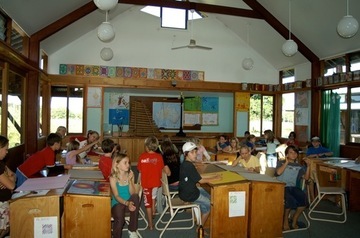 The heart-centred activities such as Movement, Painting, Form Drawing, Music and Poetry are presented in the middle part of the day, and may see the introduction of another Teacher. The afternoon session is will-oriented. It is in this activity-laden part of the day that craft and manual skills are developed. Other activities included in the afternoon are gardening, building, sport, bush walking and drama. In each term there are nine three or four-week block lessons making a total of thirty-six per year. Each Teacher is allowed the freedom to arrange the timing and appropriateness of lesson material according to the needs of his/her Class. Although there has been an attempt to group Shearwater’s Learning Program within the framework of the Key Learning Areas (KLA’s), it must be noted that – Steiner Schools endeavouring to implement a “human-centred” approach by equally educating the head (thinking), heart (feeling) and hands (the will) – the School’s Learning Program is informed by a holistic approach to education in which scholastic discipline is balanced by artistic expression and practical skills. A wonderful and most obviously recognisable example of our across-the-curriculum approach is Shearwater’s Wearable Arts event: WAVE. Since its inception in 2001, the Shearwater Wearable Arts Performance Event has become each year more deeply embedded in our High School Learning Program. Some 80% of our High School students and staff are voluntarily involved with art piece production, acting, dance, modelling, choreography, wardrobe, make-up and it’s obviously popular with our students in the Entertainment Industry Certificate III VET course, which focuses on the Event to teach its stage management, lighting, sound, stage and set construction, OH&S, security and front of house modules. These students, with the direction of their teachers, mainly run this successful Event. But WAVE reaches most students, one way or another: for example, one of the Industrial Design students constructed a revolving stage for the show as his Major Work in that subject and other event-integrated courses include Visual Art, Visual Design, Drama, Dance, Music, Design and Technology, Photography, Film-making and Digital Imaging. Rudolf Steiner meant Waldorf education to be healing and to make an important contribution to both the social circumstances of the world as well as to the moral development and integrity of the individual. This healing will, however, was not to be brought about through the addition of curative Eurythmy and artistic therapies to the school, but rather in the curriculum subjects themselves and in the ways of teaching penetrated by a true understanding of the image of man. So that the inner work of the Teacher would address and support the development of physical-organic and soul-organic processes in the child. The contribution of Waldorf Education is called for even more in our time, in which the occurrence of developmental disturbances and challenging social conditions are ever more manifold.